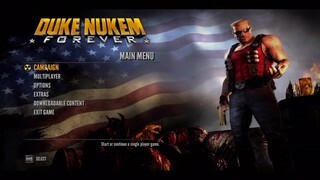 Released in June 2011, Duke Nukem Forever is a strong contender for the most disappointing game of all time, narrowly losing to that time your high-school crush invited you over for "a few rounds of Scrabble", only to bring out an actual playing board. The player controls Duke Nukem - the legend himself - while he battles aliens and occasionally slaps round shaped silicon based - you know what, I'm not even gonna finish this sentence. Note: The two weapon version and the four weapon version are considered separate categories. Best time on Piece of Cake with resets: Single-segment 2:06:38 by 'DumDumDugan' on 2014-03-27. Category: single segment, any %, two weapon limit, Piece of Cake difficulty. I prefer the two weapon limit because the four weapon limit is not available in all versions of the game. Here are some brief descriptions of the five major skips to look for. I've listed them chronologically by chapter. Skip a battle by dropping a red gas tank in front of a locked gate. Use the dropped tank to hop over the gate. This saves about three minutes. Skip the turret section in Crash Course by falling onto an invisible ledge and crawling under an I-beam. Trigger the next checkpoint and reload the checkpoint to continue. This saves about two minutes. Stack six barrels near the barn to collect the gas can faster. Reload the next checkpoint to escape the barn. Collecting the gas can this way saves about three minutes. Use a HoloDuke to distract enemies and stack three barrels by the saloon to escape town without refueling the truck. Refuel the truck with the gas taken from Ghost Town. This saves about six minutes. Stack two barrels on a precarious ledge to skip several battles in the Clarifier. This saves about two minutes. Here are the notable mistakes I made. The battle in the pit was a little slow because I didn't kill all of the enemies in the second drop ship before they left the ship. The battle with the Battlelord was also a little slow because all of the trap mines didn't hit the Battlelord. After I solved the physics puzzle, I tried to use a new trick to launch myself forward with an invisible wall. Unfortunately, the grenade I threw rolled too far away from the barrel and the trick didn't work. When I tried to skip the turret section, I failed to land on the invisible ledge on my first attempt. I wasted about fifteen seconds here. I hit a barrier and wedged the truck into an unusual position after the last jump in Highway Battle. I wasted about fifteen seconds getting the truck unstuck. One of the pig cops eluded me during the first battle, so I had to waste a few seconds to find him. After adjusting the pipes, I attempted to jump onto a small ledge and failed twice. I decided not to attempt the jump a third time. I wasted about thirty seconds in total. Getting the blue barrels to the top of the scaffolding is the slowest part of The Clarifier skip. I tried to throw the barrels straight to the top, but both barrels failed to stick on top. Some falling debris pushed me off a ledge before I could clear it. It took me about twenty five seconds to get back to the ledge.